Hard Day At The Office !! Yet again the rain comes down to make my life harder and for the clients not such a nice time, Michael turned up and it was pouring down and by the look of the river gauge it had been raining most of the night, the river was dropping but the way the rain was coming down I didn’t think it was going to be dropping for very long, so we had a chat about what we were going to do and Michael said let’s go for it. So I took him way up stream looking for clear water but we didn’t find any so deep and heavy sort of day it was going to be, it was very slow fishing to say the least but perseverance was the key and we kept plugging away and finally all the effort payed with a nice brown thrashing away in a fast flowing river, sadly all my fears were confirmed the river was on its way back up, we had a some lunch and moved on down stream to what usually is a slow moving run, but today it certainly wasn’t Michael fished the edge of the fast water and another three browns were hooked two small ones and another half decent one. The fly of the day was something that I thought I would never use, it was given to me last year or even the year before and been sat in my box, so thank you KJ for the squirmy worm, I think in conditions like this it might be close to matching the hatch in a fast flowing very coloured river. Last week we had the river the lowest Natural Resources Wales charts have ever seen this week the graph looks like a map of the sea, up and down like a yoyo, hopefully it will calm down now for this weekends guiding. Well the sun is shining, very rare here in Wales this year and the river is at an OK height even rarer, so its time to get my first impressions of what the Orvis Access 9′ 4# tip flex is like to fish with, walking along the river there is the odd fish rising, but can’t really see any insects in the air or on the water, so I thought the Access would make a lovely dry fly rod I would string it up with a 18′ tappered leader and a size 18 deer hair sedge,little bit of floatant on the dry and degreassed the tippet with some fullers earth to help it sink and foul the fish hopefully ! 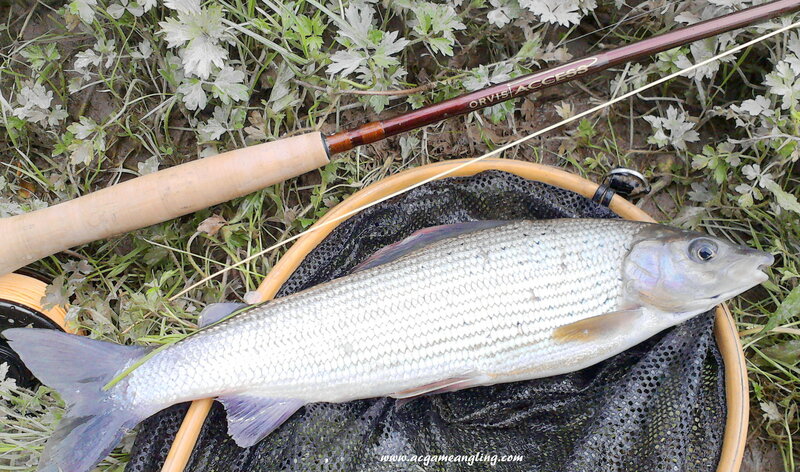 the water in front of me was quite shallow around knee depth at it’s deepest, I’m quite superstitious about new rods and like to catch on a new rod quickly, well it couldn’t get any quicker, just flicked the fly out around 15′ in front of me to work some line out and bang a nice little grayling around half a pound, the water was quite fast so the little fish put a good bend in the rod, un hooked and released and another fish came up around 25′ – 30′ from me, I placed a cast jut up in front of the fish the 4# turned over the leader perfectly into a down stream breeze and here we go again another small gralying and another, all in all around 12-14 smallish grayling and trout on the new rod, no need to be superstitious with this rod !! So far of the Access rods that I have cast I have liked them all, must try a 6 or 7# so how far the line will fly, mind I haven’t fished with anything heavier than a 4# in a long time. Been really busy this week doing some painting for my in-laws, they only live around a five minute walk from a nice river, so I took my fishing gear with me today and while I was waiting for some of the paint to dry I thought I would give it a go, I only had an hour, I caught four good grayling , six or seven smaller ones and a small trout, it would have been a cracking hour bar for two things, the wind was blowing quite strongly and I had to go back to carry on and get the painting finished, but their worth it !! All I Want Today Is !! Bit of a misty grey old day today, but I had arranged to meet my good friend Mick (we used to fish together a lot, but over the last 18 months, we hadn’t really bumped into each other much bar for the odd clay shooting day) . Anyway, the river had a little colour in it and the air temp wasn’t the warmest it’s ever been but Mick must have forgotten what it’s like to go grayling fishing at this time of year, too much time spent after the salmon, one pair of socks, no thermals, someone was going to be a little chilly. Mick had first pick on where to fish whch was rather nice looking, so I thought I would try a little further upstream. Looking at the run it was quite pacey, so I thought I would start with a sort of heavy, buggy sort of French nymphing, Tungsten bead nymph on the point and two bobesh type patterns on the droppers. 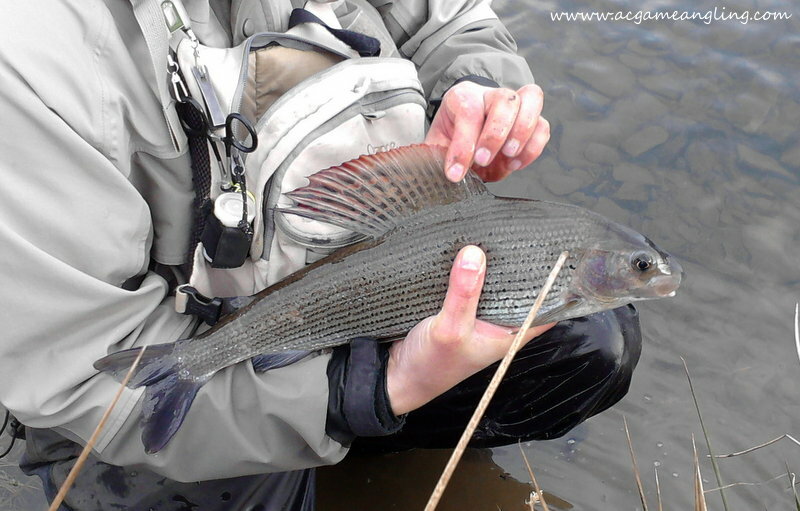 As I worked my way down the run there was one very small grayling to the top dropper. Just on the other side of the creasse I was fishing was a nice slower back eddie. I flicked the flies into it and straight away there was a bite, it was a trout of around 3/4 lb which I quickly released and tried again. On the next cast I got another trout, then another. In about seven casts I had five trout, to be honest the whole of the run was alive with trout and all coming to a SP nymph. 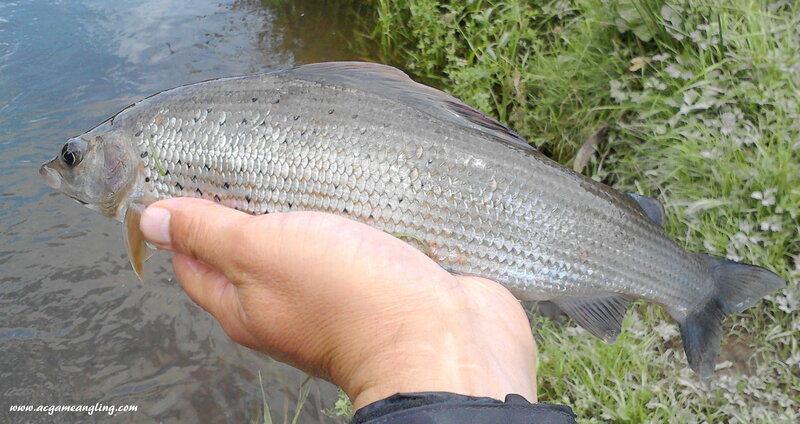 Then, at last a grayling, not very big around 3/4 lb. As I worked my way down the run I’m not sure how many fish I caught, but around 12 grayling and a hell of a lot more trout as the river was alive with them. I walked down to see how Mick was getting on, he was already on the river bank, saying how cold his feet were, thought they might have been. So we decided to have a walk and warm up a little. We walked around half a mile upstream, there were a lot of interesting looking runs and glides. Mick had first choice and went upstream a little further to a log glide. There was a little bit of pace at the top of the run so I put on a lighter point fly and carried on in the same fashion as before, but it didn’t seem to be working as well as before. I did catch four fish, but I thought it should be better than that, so I went back to the top of run and swapped over to trio. The nymphs I had on the trio set up were the same as the french nymphing rig, what a difference, I seemed to pick up fish straight away. I think it was because the flies were drifting throught the water and the presentation was much better. I do Trio a bit like French nymphing, long leader to the dry, movable as always, then the two nymphs off that, around twenty foot in all. I was really gutted I dropped two fish, which seemed to be good lumps, I checked the hook points but all seemed fine, I was gutted but more determined to get a a good one. Well the best fish of the day couldn’t have come at a better time as Mick just appeared on the bank behind me, when I finally got it in the net, a quick pic and a measure and back in the water, it was a cracker at 48cms. I said to Mick “I’m happy now, that will do for me today” and I left it at that, Mick’s feet were frozen so we decided to get something to eat and call it a day, great company and a really good day.